Yes, that's a steak and a salad here in my hotel room. Otherwise known as Room Service. Otherwise known as, yes, I miss my dear husband, but I am enjoying my time in my Orlando hotel room alone tonight with my steak, my salad, and myself. I was bummed (again) to see that I have no MTV and/or TLC, so that means no "Teen Mom" and/or "Toddlers and Tiaras." Darn it. I only have cable when I'm staying in hotels because we are cable free at home. I really don't miss it. But, when I'm alone for a night, living the single girl life, I do love those shows and some Milanos if you know what I mean! Michael is hanging out tonight with some old friends from Florida who are in town. We got to chat earlier while they went to see the Lincoln Memorial at night. I know he is having a great time. What a good night for both of us. I am so thankful for good friends who help him out when I'm not there. Well, I better get to sleep... long day tomorrow. I will be working my tail off! P.S. My favorite part of room service is always the mini ketchups and mini A1 sauces. I secretly want to start a collection of those. 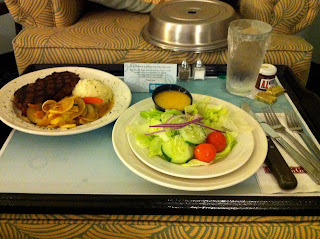 I realized I finally had to post a comment when I read this post - I have read your blog for a while but this love for room service and TV on work trips I can totally relate to! I don't have a TV at home (mainly because I think I wouldn't do anything else ever) so it is such a treat! A work trip without a night with room service and TV is a horrible work trip! Great blog! Greetings from a fellow DC'er. The best alone time has to be with room service! Love it! Also- I think there was a time when I did collect those little ketchups and mini tabasco sauces. They were really cute!